Los Angeles’ award-winning art collective Rogue Artists Ensemble takes its latest creation, HYPERBOLE: bard on tour to Orange County, Culver City, West Hollywood, Oakland, San Francisco and Oregon July 26 through Aug. 24. In this hyper-fun, hyper-family-friendly performance, Rogue Artists Ensemble takes Shakespeare’s best characters, poetry and plot devices and shuffles them up, twists them around, and shakes them down. Remixing Shakespeare with intricate mask work, original puppets and live music, the Rogues dig down to the heart of the Bard, sharing the joys, the sorrows and the non-stop action that everyone, from kids to Shakespeare aficionados, loves about the greatest playwright of all time. 5222 E. La Palma Ave.
*Indoor shows feature bonus scenes, shadow puppets and effects. **The performance at West Hollywood’s Kings Road Park is made possible in part by the Free Theatre in the Parks program. ***The performance at Culver City’s Carlson Park is made possible in part by a Culver City Art in Public Places Program Performing Arts Grant with support from Sony Pictures Entertainment. Rogue Artists Ensemble differs from other theater companies in that it is run by a collective of multi-disciplinary artists and designers rather than by actors, writers or directors. By combining ancient storytelling techniques (music, dance, masks, puppetry) with modern technology (digital media, special effects and theatrical illusions), the Rogues cultivate a unique style of live performance unlike any other. They define the combined use of these and other underrepresented art forms as Hyper-theater. Since 2002, the Rogues have created over a dozen original new works and collaborated with hundreds of artists and community members. 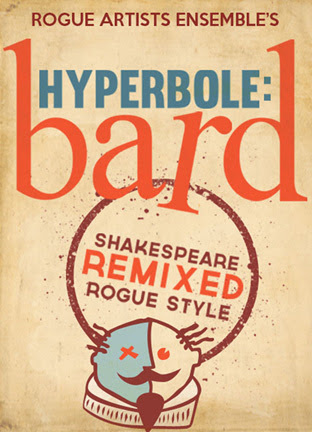 For more information call (213) 596-9468 or visit www.rogueartists.org/hyperbole-bard.